Plastic Assembly Services- Brogan & Patrick Mfg. Corp. Plastic Assembly for Different Industries | Brogan & Patrick Mfg.Corp. Brogan & Patrick Mfg.Corp. 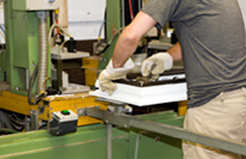 is a leading provider of complete solutions for plastic assembly services. Our expertise in plastic part assembling is a result of the right mix of attention to detail and utilization of state-of-the-art technologies. We also provide full service sonic welding capabilities. We can fully assemble a one piece product made from several pieces. When designing molding components for sonic welding, many variables must be analyzed. At Brogan & Patrick Mfg.Corp., our expertise in sonic welding and the design of components used in sonic welding enable us to be one of the top suppliers of sonic welded parts in the industry.